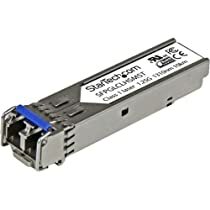 Startech Cisco Compatible Gigabit Fiber Sfp Transceiver Module Sm Lc . 10 Km (Mini. Gbic) . 1 X 1000Base. Lh "Product Type: Routing/Switching Devices/Modules"
This 1310nm single-mode SFP module is compatible with the Cisco GLC-LH-SM transceiver. Also a perfect accessory for the Startech PCI Express Open SFP NIC (PEX1000SFP), or Gigabit POE Open SFP Media Converter (ET1110PSE) products. Backed by a Startech 3-year warranty and free lifetime technical support.